Speaking to reporters at the Fine Gael National Conference in Wexford today, the Taoiseach reiterated that if the UK leaves the EU with no deal, then “difficult discussions” will be needed with the European Commission and the UK on the border issue. “We know from the UK government’s own plans that if we did end up in a no-deal scenario that they would treat Northern Ireland separately from day one,” Varadkar said. Last night, Tánaiste Simon Coveney said there have been no formal discussions with the European Commission about how to prevent a hard border in Ireland, though he said they have “thought about” it. The only way to avoid it would be to have regulatory alignment, but he said the they are still advocating for the backstop. Today, Varadkar described the plan to avoid the hard border was “a sketch” at this stage, pointing out the regularity alignment, which is contained in the backstop, is what it looks like. Pressure is mounting on all sides at the deadline dates for Brexit are pushed out. However, questions about the possibility of a hard border remain. Theresa May has said a third vote on her Brexit deal may not happen next week if there is insufficient support to approve it. It was agreed on Thursday that date the UK would leave the EU would be delayed until the 22 May if the deal was passed. However, if the deal is rejected, the date would be delayed by two weeks until 12 April. In a letter to MPs yesterday evening, May said she would only bring her withdrawal agreement before the House of Commons if there was sufficient support for it. Leave with no deal on 12 April. Request another extension before 12 April which would mean Britain taking part in European elections. Approve May’s deal next week. Bear in mind House Speaker John Bercow has said he won’t allow it to be put to a vote unless substantial changes are made to it. “If it appears that there is sufficient support and the speaker permits it, we can bring the deal back next week and if it is approved we can leave on May 22,” May wrote to MPs. Speaking to Virgin Media News this evening, Taoiseach Leo Varadkar said he has some sympathy for May, but not when it comes to politics. “I’ve enormous sympathy for her and enormous respect for her. 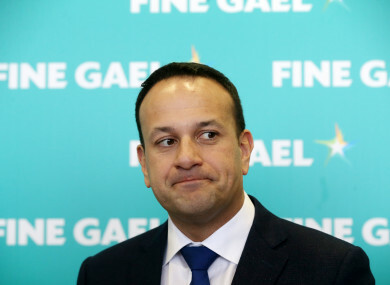 Being the Prime Minister of the United Kingdom at this time is an exceptionally difficult job, especially with the divided parliament and a divided government,” Varadkar said. “At the same time, let’s not deny an obvious truth. This problem, Brexit, is entirely one of their own creation,” he said. Personal sympathy, yes. Political sympathy, very hard to have sympathy in those circumstances. EXCLUSIVE: Taoiseach @LeoVaradkar admits he has some sympathy for Theresa May, over the issues she is facing regarding #Brexit. Brexit protesters are set to march in London today demanding a second referendum. Scottish First Minister Nicola Sturgeon has said she would join while deputy Labour leader Tom Watson has said he would back the Prime Minister’s deal but only if she agrees to hold a referendum on it. “The EU’s decision to postpone things until at least 12 April has opened a window and those of us who oppose Brexit must seize the chance it offers,” Scotland’s Sturgeon said. The ‘Put It To The People’ march is due to start at midday and will finish at the Houses of Parliament. Meanwhile, Tánaiste Simon Coveney has said there have been no formal discussions with the European Commission about how to prevent a hard border in Ireland while the DUP has criticised the UK government, and called the delay to the date by which the UK leaves the European Union “a humiliation”. Email “Plans to avoid a hard border in a no-deal scenario are 'very rough', says Varadkar”. Feedback on “Plans to avoid a hard border in a no-deal scenario are 'very rough', says Varadkar”.